Sports giant Decathlon, offering equipment for more than 70 sports disciplines, opened its doors in BTC City Ljubljana • BTC d.d. BTC City Ljubljana visitors can find top notch sports equipment for 70 sports disciplines in the first Decathlon store in Slovenia. Professional and amateur athletes and all beginners are able to find equipment for their favourite sport. The first Decathlon store was opened in 1976 in France. 40 years later, this international chain of sports equipment stores finally opened its doors also to Slovenian sport enthusiasts. 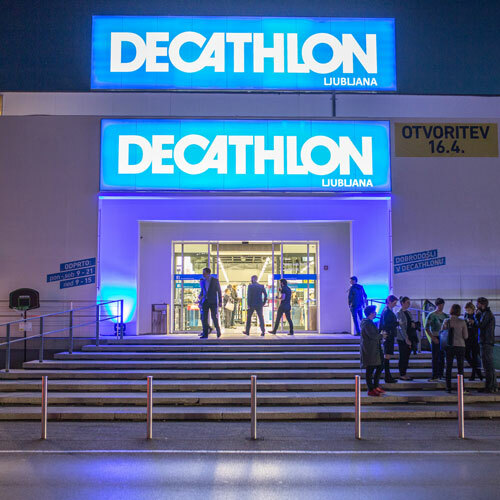 The first Decathlon store in Slovenia, which extends over 2,750 square metres in Hall 18 of BTC City Ljubljana, realises the global Decathlon mission – with its offer of sports equipment to enable all amateur and professional athletes to be active in their favourite sport. At the same time, Decathlon follows the motto “All sports under one roof”, as its offer pertains to individual and team sports, including running, swimming, cycling, soccer, basketball, as well as hiking, surfing, horseback riding, archery and ballet. The Slovenian Decathlon store combines a vast selection of sports equipment all under one roof. The selection encompasses more than 100,000 products of 70 labels of leading manufacturers of sports equipment and a group of Decathlon’s own labels under the name “Passion Brands”, which include Quechua, Nabaiji, Kalenji, Domyos, Kipsta, and Newfeel. Products on offer by Decathlon’s own labels since 1996 are manufactured in the most modern Decathlon research centre. As such, they offer the best quality to price ratio. Although Decathlon is known as the provider of sports equipment at reasonable prices, that does not affect the quality of their products and services. The Decathlon employees across the world share common passion for sports and their expert knowledge, which guarantees the best possible shopping experience to every buyer. On top of it all, shoppers can try out the products before buying them and take full advantage of the in-store repair of products. Decathlon has refreshed the offer of sports equipment in BTC City Ljubljana, which in this year casts a strong light on sports, as it has been overtaken by the Olympic spirit. The store is the herald of Decathlon’s entry onto the Slovenian market. The sports giant which in 2015 employed 70,000 people across 27 countries of the world and made an income of 9.1 billion Euros is planning to expand to other Slovenian cities. Altogether, Slovenia is looking forward to more than 100 new employment positions.